St. Charles is one of the oldest counties to be settled. It was settled in 1769 and was organized in 1816. 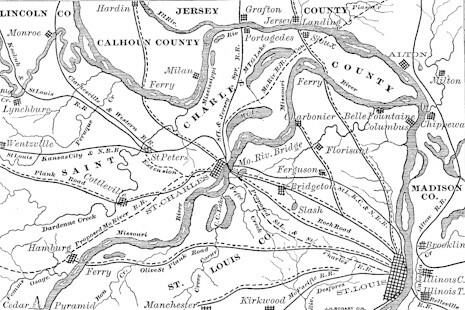 During the Missouri territorial times, St. Charles is situated between the Missouri and Mississippi Rivers as is today. In 1872, there was about 327,000 acres of land much of that was in prairies. The prairies included Point, Dog, Allen’s, Dardenne, Howell’s, and other small prairies. The soil in the county was good due to the rivers and there was a wide variety of crops grown. The population in 1865 was about 16,000. The land was laid out in a format used by the French Government. The measurement of the land was one arpen wide and forty arpens long. An arpen or arpent was equal to .85 of an acre. The only condition of these lands was that they were to be worked and the amount of land given to the farmer depended on his ability to work, number of family members, and other circumstances that surrounded him. Many farms that lay next to each other were fenced together forming “common fields”. The “common fields” were named after the closest French village and these fields would sometimes contain as many as forty or more individual farms. Many crops were grown in this county such as corn, oats, Irish and sweet potatoes, tobacco, and grapes. The most profitable were wheat (50bu/ac), corn (40bu/ac), oats (35bu/ac), and hay (timothy and clover). Livestock in the county was in abundance as well. The slaughter weight on hogs was about two hundred pounds and about twenty thousand head were exported or driven to market. The twenty thousand cattle were mainly mixed breeds made by a cross of Durham or some other imported breed. Dairies were obsolete in this county, but a lot of butter is made in the city and that is where it was sold. The price of a workhorse was about one hundred ten dollars and a good horse sold for about two hundred dollars. The colts were of Morgan and English gray stock and brought about seventy dollars from birth to breaking age. Mules were raised, but mainly for use and prices were low. Sheep raising was profitable in this county, but too many dogs were being raised to please the sheep farmers. The fruit raised in the county included apples, pears, and peaches. The county has portable cider mills, in which a large quantity of apples ended as cider. Other fruits were grown as well-cherries, plums, apricots, and blackberries. The leading staples in 1871 were wheat, corn, and tobacco and these commodities had the highest numbers of export. The crops yields of 1871 were not equal to previous years because of the lack of rain. There was an excellent market because the Northern Missouri Railroad passed through and the Missouri River flowed along the boundary. The ultimate western market for the produce in this county went to San Francisco, because a variety of fruit could be grown here. The cost of land in 1872 was from three dollars to one hundred dollars (depending on the location). The price of land had decreased since the war anywhere from twenty to twenty five percent. There were three coal pits that were being worked at this time, but the coal that was mined only meets the needs of the city. The pits employed about fifty people. Iron and lead have been found, but money couldn’t be made off the quantity. St. Charles had, had a successful silk-worm establishment for the past four years. Stockings and gloves were made from the fine silk produced here. In Switzerland, a disease amongst the worms had devastated the silk-worm industry. A package of silk-worm eggs was shipped from St. Charles to Switzerland to help reestablish the population of worms. In the past eight years, three hundred immigrants had come to this county. The immigrants were mainly German farmers and mechanics. Manufacturing was increasing quite rapidly and quite extensive. There was a wide variety of manufacturing including thirteen flouring mills, two woolen mills, six tobacco factories, two pork packing houses, a large furniture factory, a cheese factory, twelve saw mills, twelve wagon factories, and a numerous copper and blacksmith shops. In Wentzville, Gieseke & Bro. had an establishment for making cornstarch, grape sugar, and glucose. This was said to be the only one of its kind in the United States. Chinch bugs were not as much of a problem in this county as it was in others. The estimated damages per year were about $25,000, which was considered low. No real systematic effort was made to eradicate the insects, but some tried hot water, coal oil, and some tried ditching across the fields to get rid of the bugs.